Overexpression of the human epidermal growth factor receptor (HER)-2 oncogenic receptor tyrosine kinase, which occurs in 25% of breast cancers, portends poor clinical outcome and consequently represents an attractive target for therapeutic intervention. Small molecule tyrosine kinase inhibitors that compete with ATP binding at the cytoplasmic catalytic kinase domain of HER-2 block autophosphorylation and activation of HER-2, resulting in inhibition of downstream proliferation and survival signals. These agents have exhibited clinical activity in patients with HER-2 overexpressing breast cancers. Here we review the development of HER-2 tyrosine kinase inhibitors, their mechanisms of action, their biological and clinical activities, their safety profile, and combination strategies including conventional cytotoxics and other targeted agents. Members of the human epidermal growth factor receptor (HER) family of transmembrane receptor tyrosine kinases (HER-1/epidermal growth factor receptor [EGFR], HER-2, HER-3, and HER-4), particularly EGFR, HER-2 and HER-3, promote tumor cell proliferation and survival in a variety of epithelial malignancies. HER-2 protein overexpression or gene amplification, which occurs in approximately 25% to 30% of breast cancers, portends poor clinical outcome [1–3]. Members of the epidermal growth factor family of soluble ligands bind to their cognate HER receptors and induce formation of HER receptor homodimers or heterodimers, resulting in autophosphorylation of specific tyrosine residues within the cytoplasmic catalytic kinase domain of the activated receptor (Figure 1) . These tyrosine autophosphorylation residues serve as docking sites for SH2 (Srchomology 2) and phosphotyrosine-binding domain containing protein, which links the activated, phosphorylated HER receptor with downstream cell proliferation (mitogen-activated protein kinase [MAPK]) and survival (phosphatidyl-inositol-3 kinase [PI3K]) signaling pathways (Figure 1) [5, 6]. HER receptor heterodimers are potent signaling complexes, with HER-2 being the preferred heterodimeric partner. Consequently, HER-2 represents an attractive target for cancer drug development. HER-2 containing heterodimers and their downstream signaling effects. Shown are distinct HER-2 containing heterodimers, ligands that activate respective receptor complexes, downstream linked signaling pathways, and their putative functional effects in HER-2 overexpressing breast cancers. AR, amphiregulin; BTC, betacellulin; EGFR, epidermal growth factor receptor; EPR, epiregulin; HB-EGF, heparin-binding epidermal-like growth factor; HER, human epidermal growth factor receptor; MAPK, mitogen-activated protein kinase; NRG, neuregulin; PI3K, phosphatidylinositol-3 kinase; TGF, transforming growth factor. Trastuzumab (Herceptin®; Genentech, South San Francisco, CA, USA) is a humanized anti-HER-2 monoclonal antibody that has been approved for treatment of patients with breast cancers that overexpress HER-2 protein or that exhibit ErbB2 gene amplification. It has revolutionized the treatment of HER-2 overexpressing breast cancers by improving survival in metastatic breast cancer when combined with cytotoxic agents; recently, it also exhibited significant clinical efficacy in the adjuvant breast cancer setting [7–12]. The precise mechanism(s) by which trastuzumab exerts its anti-tumor effects is unknown, although it is probably multi-factorial, including antibody-dependent cell mediated cytotoxicity , downregulation of HER-2 signaling following antibody mediated receptor internalization , inhibition of cell proliferation and survival signals [15, 16], and interference with DNA repair . However, the majority of HER-2 overexpressing breast cancers do not respond to trastuzumab therapy alone. Several mechanisms of resistance have been proposed, including the following [18–24]: expression of redundant survival signaling pathways (for example, the insulin-like growth factor [IGF] receptor); deficient expression of the PTEN tumor suppressor gene; expression of p95HER-2, a highly active truncated form of HER-2 that lacks the extracellular domain, which is the recognition site for trastuzumab; and downregulation of the cyclin-dependent kinase inhibitor p27kip1. However, these mechanisms of trastuzumab resistance do not appear to preclude the antitumor activity of small molecule inhibitors of HER-2 kinase, as is discussed below. In addition to targeting HER-2 using antibody therapies, small molecule tyrosine kinase inhibitors (TKIs) that compete with ATP for binding at the HER-2 catalytic kinase domain block HER-2 signaling (Table 1). These compounds may be reversible (for instance GW572016 [lapatinib]; GlaxoSmithKline, King of Prussia, PA, USA)  or irreversible inhibitors (for example CI-1033 [canertinib]; Pfizer, Groton, CT, USA) . Most of these compounds target more than one HER receptor, which has the potential advantage of simultaneously blocking two or more heterodimer components. EGFR, epidermal growth factor receptor; HER, human epidermal growth factor receptor. However, many so-called HER specific inhibitors are promiscuous kinase inhibitors. A recent study  investigated the specificity of 20 TKIs that are approved by the US Food and Drug Administration or are currently in clinical trials. Their binding specificity against 113 kinases, mostly tyrosine kinases with an additional small number of serine/threonine kinases, was then determined using clinically relevant drug concentrations (namely plasma concentrations achieved in patients administered the clinically recommended dose). The following drugs with HER-2 kinase inhibitory activity were evaluated: canertinib (pan-HER irreversible inhibitor), EKB-569 (EGFR, HER-2 irreversible inhibitor), lapatinib (EGFR, HER-2 reversible inhibitor), and gefitinib and erlotinib (mono-EGFR reversible inhibitors). Of the 20 drugs evaluated, lapatinib was the most specific inhibitor, binding its intended targets (EGFR and HER-2) with high affinity and an additional two kinases (STK10 and SLK) with markedly lower affinities. In contrast, EKB-569 was found to be a rather promiscuous kinase inhibitor, binding 56 of the 113 kinases tested, as well as binding several non-HER kinases at similar affinities to its target EGFR. CI-1033 (canertinib), which is purportedly a specific inhibitor of EGFR, HER-2 and HER-4, is also promiscuous, binding 36 of the 113 kinases tested. The promiscuous nature of these drugs has the potential to contribute to increased toxicity. In addition, not all HER receptors are necessarily desirable targets in breast cancer. For example, HER-4 is associated with a more differentiated, less aggressive breast cancer and is a favorable prognostic factor in breast cancer, and therefore it may not be a desirable therapeutic target in breast cancer . Most of the small molecule HER kinase inhibitors share similar pharmacokinetic profiles. They tend to exhibit prolonged plasma half-lives (> 24 hours), to exhibit dose-proportional kinetics, to be highly protein bound, and to be metabolized rather than undergo renal excretion [29, 30]. Small molecule HER-2 kinase inhibitors are typically potent, with a 50% inhibitory concentration against HER-2 in the low nanomolar range, based on in vitro kinase assays [26, 31, 32]. 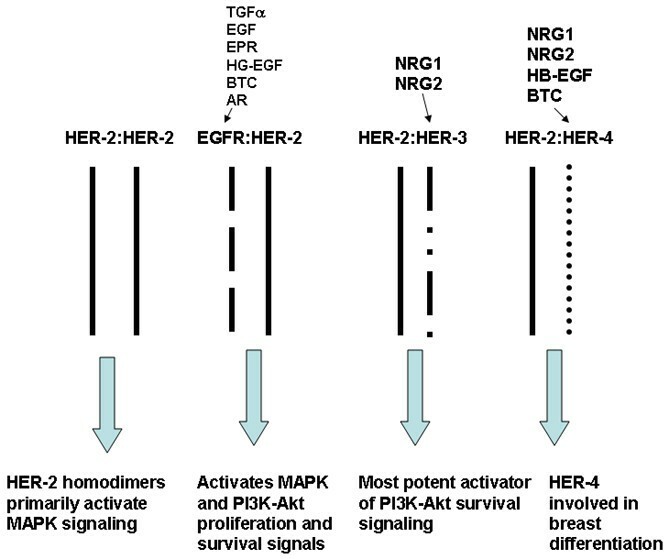 Inhibition of HER-2 autophosphorylation triggers a cascade of events that block signaling via the MAPK-Erk1/2 and PI3K-Akt signaling networks in HER-2 overexpressing tumor cell lines and breast cancer xenografts [25, 26, 31, 33]. In contrast to antibody-based therapies, small molecule HER-2 kinase inhibitors reduce phosphorylated but not total HER-2 expression [25, 26, 31, 33]. Inhibition of HER-2 autophosphorylation and downstream signaling pathways in preclinical models is important, but ideally one would wish to demonstrate these effects in the clinic. Skin, an easily accessible EGFR expressing tissue, served as a surrogate to determine the effects of erlotinib and gefitinib on EGFR phosphorylation, and on the MAPK-Erk1/2 and PI3K-Akt pathways [34, 35]. Unfortunately, biologic effects in skin do not necessarily correlate with clinical response . Studies have attempted to evaluate the biologic activity of HER-2 kinase inhibitors in tumor biopsies obtained from patients on clinical trials. For example, a phase Ib study of lapatinib monotherapy in 67 patients , 50% of whom had breast cancer, showed that lapatinib inhibited HER-2 and EGFR phosphorylation at day 28 of therapy, with consequent reduction in the expression of phospho-Erk1/2, phospho-Akt, and cyclin D1; importantly, it also increased tumor cell apoptosis (by terminal dUTP nick-end labeling [TUNEL]). Biologic responses were often associated with partial responses and prolonged stable disease. A panel of candidate tumor biomarkers was identified that predicted response to lapatinib monotherapy in women with breast cancer, which included overexpression of HER-2, expression of phosphorylated HER-2, and baseline TUNEL score greater than 0 (evidence of spontaneous tumor cell apoptosis). Although inhibition of HER-2 phosphorylation, phospho-Erk1/2, and phospho-Akt may be necessary for clinical response to lapatinib, they are not sufficient. Downregulation of survivin, a member of the IAP (inhibitor of apoptosis protein) family and a predictor of adverse clinical outcome in breast cancer, appears to represent a more robust correlate of clinical response associated with inhibition of HER-2 autokinase activity by lapatinib in HER-2 overexpressing breast cancers . In addition to lapatinib, sequential tumor biopsies were obtained during a phase I study (n = 53) conducted in patients with solid tumors treated with canertinib . The biologic effects of canertinib on its intended targets (namely phospho-EGFR and phospho-HER-2), cell proliferation (Ki67), and expression of the cyclin-dependent kinase inhibitor p27 were assessed. Immunoprecipitation and Western blot analysis conducted in nine tumor biopsies showed a median reduction in phospho-EGFR protein levels of 44%, a 26% reduction in Ki67, and a 56% increase in p27 steady-state protein expression at day 15 of therapy compared with baseline (pretreatment) biopsies. Cardiotoxicity is a significant concern among patients treated with trastuzumab who were previously treated with anthracyclines . In first-line treatment of advanced stage breast cancer, trastuzumab in combination with anthracycline and cyclophosphamide (AC; n = 143) resulted in 27% and 16% incidences of any cardiac dysfunction and New York Heart Association class III-IV heart failure, respectively, as compared with 7% and 5% with trastuzumab alone, and 7% and 3% with anthracycline and cyclophosphamide alone . Although the precise mechanism of trastuzumab-induced cardiotoxicity is unknown, HER-2 appears to serve as a survival factor for cardiac myocytes . Recently, an increased incidence of cardiotoxicity was demonstrated in patients receiving imatinib , which targets members of the abl kinase family, raising questions as to whether small molecule TKIs, particularly those targeting HER-2, might also have cardiotoxic effects. Lapatinib appears to carry lower risk for cardiotoxicity compared with trastuzumab . For example, in a randomized phase III clinical trial comparing the combination of lapatinib plus capecitabine with capecitabine alone in women with relapsed HER-2 positive breast cancer previously treated with an anthracycline and trastuzumab , there were four asymptomatic cardiac events in the lapatinib/capecitabine arm (n = 163). All lapatinib trials excluded patients with left ventricular ejection fraction of 50% or less, or below the lower limit of institutional normal levels, potentially biasing the data by selecting those individuals who are at lower risk for developing cardiotoxicity. Because dual EGFR/HER-2 and pan-HER inhibitors are potent inhibitors of EGFR signaling, it is not surprising that their major toxicity is EGFR related, including skin rash and diarrhea, the latter representing the dose-limiting toxicity for most of these compounds [30, 44]. In addition, caneritinib use was associated with thrombocytopenia . Lapatinib, a dual EGFR/HER-2 TKI, is the most clinically advanced of the HER-2 kinase inhibitors in breast cancer. The initial suggestion of clinical activity in breast cancer was demonstrated in a phase Ib dose-ranging study in which 30 heavily pretreated breast cancer patients received lapatinib monotherapy ; of these patients, four experienced confirmed partial responses and 10 others had prolonged stable disease. The four partial responses were all in patients with HER-2 overexpressing breast cancers [36, 44]. Interestingly, four out of five patients with inflammatory breast cancer (IBC) treated in phase I lapatinib trials (monotherapy and combination studies) achieved a partial response; of these two received lapatinib monotherapy and one each on lapatinib and paclitaxel, and lapatinib and capecitabine combination studies [44–46]. All of these IBC responders overexpressed HER-2. This encouraging activity led to a phase II trial of lapatinib monotherapy in patients with recurrent/anthracycline-refractory IBC. Patients were assigned to one of two cohorts depending on whether their tumor overexpressed HER-2 or did not overexpress HER-2 but expressed EGFR. The preliminary data were recently reported at the 31st Annual Meeting of the European Society of Medical Oncology . Patients received oral lapatinib (1500 mg/day) monotherapy on a continuous basis. Approximately 50% (16 out of 30) of the patients in the HER-2 overexpressing cohort achieved a complete or partial response in skin/chest wall lesions and/or RECIST target lesions, as compared with only about 7% (1 out of 15) of patients in the EGFR expressing, HER-2 non-overexpressing cohort. These results are encouraging in light of the heavily pretreated nature of these patients with aggressive IBC, and they further highlight the significance of HER-2 overexpression as a predictor of response to lapatinib monotherapy in breast cancer. Further studies investigating the use of lapatinib in IBC, both as a monotherapy and in combination with other agents, are currently underway. Two large phase II clinical trials in which heavily pretreated patients with HER-2 overexpressing breast cancer received lapatinib monotherapy demonstrated marginal clinical activity, with seven of the initial 81 evaluable patients achieving an objective response . Targeted therapies such as lapatinib will probably be more effective in the setting of earlier disease, especially when they are used as monotherapy. In this context, a phase II clinical trial of lapatinib monotherapy was conducted in chemotherapy-naïve patients with metastatic HER-2 overexpressing (positive by fluorescent in situ hybridization) breast cancer. An interim analysis of the first 40 patients  identified a response rate of approximately 30%, with a similar percentage of patients experiencing stable disease. The treatment of most cancers relies on the use of combinations of non-cross-resistant drugs. In this context, a multicenter, open-label, randomized phase III clinical trial comparing lapatinib and capecitabine versus capecitabine alone  was conducted in patients with HER-2 over-expressing (3+ by immunohistochemistry or positive by fluorescent in situ hybridization) metastatic or locally advanced breast cancer. Eligibility required documented progression on prior anthracycline, taxane, and trastuzumab therapy. The primary clinical end-point was time to progression in the intention-to-treat patient population. Overall survival, response rate, and progression-free survival were secondary end-points. Based on an interim analysis conducted by an independent safety review board in 321 patients (160 in the lapatinib plus capecitabine arm, and 161 in the capecitabine monotherapy arm), there was a statistically significant improvement in median time to progression in the lapatinib plus capecitabine arm (36.9 weeks) as compared with the capecitabine monotherapy arm (19.7 weeks; P = 0.00016). Similarly, there was a statistically significant increase in progression-free survival, with median progression-free survival in the combination arm being 36.9 weeks as compared with 17.9 weeks in the capecitabine monotherapy arm (P = 0.000045). There did not appear to be statistically significant differences in response rate between groups, although there was a trend in favor of the combination arm. The study was terminated early because of superiority, based on the recommendation of the independent safety review board, making it difficult to determine whether there was a difference in overall survival between the two arms. Additional lapatinib combination studies in various settings of breast cancer are currently ongoing, including combinations with taxanes, trastuzumab, aromatase inhibitors, and antiestrogens. Early phase clinical trials conducted in patients with breast cancer suggested that this pan-HER irreversible TKI has clinical activity in this setting. Results from a phase II trial of canertinib monotherapy in advanced stage breast cancer (n = 32), which has completed accrual, are pending. In addition to the typical EGFR-related toxicity, there is a 28% incidence of thrombocytopenia associated with canertinib, which might complicate its combination with myelosuppressive cytotoxic agents . HKI-272 is a dual EGFR, HER-2 irreversible TKI that is currently in early phase clinical development. Recently presented preliminary phase I data from 51 patients with solid tumors, 23 of whom had advanced stage breast cancer, indicate that there were two confirmed and two unconfirmed partial responses in breast cancer . The encouraging response rate in this phase I, heavily pretreated patient population led to the initiation of a phase II clinical trial of HKI-272 monotherapy in patients with advanced stage breast cancer. BIBW 2992 is an irreversible inhibitor of HER-2 and EGFR tyrosine kinases. Phase I studies investigating different dosing schedules (14-day treatment/28-day cycle and 21-day treatment/28-day cycle) have been undertaken in 22 patients with solid tumors. Prolonged stable disease rather than complete or partial response have been observed in these phase I studies . BMS-599626 is an oral pan-HER receptor kinase inhibitor that is currently in phase I clinical trials. TAK 165 is a selective irreversible inhibitor of HER-2 kinase, which has demonstrated activity against HER-2 overexpressing breast cancer cell lines. It is also worth noting that EGFR mono-inhibitors, such as gefitinib and erlotinib, have exhibited very limited clinical activity when used as monotherapy in the setting of advanced stage breast cancer. Their use in combination with antiestrogens to prevent the development of tamoxifen resistance continues to be an intriguing application pursued in the clinic [52, 53]. In addition to the convenience of an oral drug compared with an antibody requiring weekly intravenous infusions, there appears to be reduced risk for cardiotoxicity with lapatinib compared with trastuzumab; the reasons for this difference are probably inherent to the disparate biologic effects of lapatinib and trastuzumab. Drugs with reduced risk for cardiotoxicity may be particularly desirable in the adjuvant setting, in which the long-term effects of cardiotoxicity are less acceptable. As patients with HER-2 overexpressing breast cancers live longer on trastuzumab-based therapies, the incidence of central nervous system (CNS) metastasis increases. Large molecular weight molecules (for instance, trastuzumab) do not effectively cross the blood-brain barrier. Small molecule HER-2 kinase inhibitors have the advantage that they are able to cross into the CNS. A pilot study of lapatinib monotherapy in breast cancer patients with brain metastases demonstrated that lapatinib crosses the blood-brain barrier, has a biologic effect in brain tumors (as determined by changes in fluorodeoxyglucose positron emission tomography), and exhibits clinical activity . In addition, in a randomized phase III clinical trial comparing lapatinib plus capecitabine (n = 163) with capecitabine monotherapy (n = 161) in relapsed breas cancer , there were fewer CNS relapses in the combination arm (four CNS relapses) than in capecitabine monotherapy arm (12 CNS relapses). Additional studies are in progress to expand upon these initial observations. Finally, three proposed mechanisms that mediate resistance to trastuzumab do not appear to be relevant to HER kinase inhibitors such as lapatinib. First, expression of IGF receptor 1 in HER-2 overexpressing breast cancers, which confers resistance to trastuzumab, does not preclude response to lapatinib and may predict a more favorable clinical outcome [36, 47, 49, 55]. Second, PTEN deficiency, which purportedly mediates trastuzumab resistance , does not appear to affect response to lapatinib [47, 56]. Finally, the presence of p95HER-2 (the truncated HER-2 receptor that lacks the extracellular domain), which exhibits increased expression with disease progression and confers resistance to trastuzumab, remains sensitive to lapatinib in preclinical models . Although infrequent, activating mutations in the HER-2 kinase domain are present in certain epithelial tumors . Recently, Arteaga and coworkers  showed that lapatinib and caneritinib, but not mono-EGFR inhibitors, were active against cells expressing these mutations. Thus, in the future, the specific HER-2 mutation identified could be used to direct choices regarding the optimal HER targeted therapy. HER-2 targeted therapies are more effective when they are combined with other agents, as indicated by the enhanced clinical efficacy of trastuzumab when it is used in combination with cytotoxics as compared with trastuzumab monotherapy. Is there a rationale for selecting drugs that are more likely to enhance the efficacy of HER-2 kinase inhibitors? The answer is 'yes'. There may be a biologic explanation for why the combination of lapatinib and capecitabine is effective, which includes lapatinib-mediated downregulation of thymidine synthase, an enzyme associated with resistance to 5-fluorouracil . Whether HER-2 kinase inhibitors will exhibit enhanced efficacy in combination with other classes of cytotoxic agents remains to be determined. We have an opportunity to combine HER-2 kinase inhibitors with other targeted therapies. Preclinical studies have demonstrated enhanced antitumor activity and inhibition of survivin in HER-2 overexpressing breast cancer cell lines in response to combined trastuzumab and lapatinib therapy as compared with either agent as monotherapy . Furthermore, a recent phase I trial of trastuzumab and lapatinib  identified a 23% response rate in advanced stage, heavily pretreated breast cancers. These results triggered an ongoing phase III randomized clinical trial of trastuzumab and lapatinib. Crosstalk between estrogen and HER receptors provides a rationale for combining antiestrogens with HER targeted therapies. We established a model of autoresistance to lapatinib in which resistance was mediated in part through the upregulation of estrogen receptor signaling . Combining specific antiestrogens with lapatinib prevented the onset of lapatinib autoresistance. These preclinical studies provided a rationale for subsequent phase II/III clinical trials combining lapatinib with various antiestrogen therapies. In light of the crosstalk between IGF receptor 1 and HER receptors, combining therapies targeting both pathways makes sense scientifically. Recently, Esteva and colleagues  reported enhanced antitumor effects of combined lapatinib with IGF receptor 1 specific antibodies in breast cancer cells. Similarly, the crosstalk between the vascular endothelial growth factor (VEGF) receptors and HER receptors provides a rationale for combining HER-2 kinase inhibitors with anti-VEGF antibodies (for example, bevacizumab) or small molecule VEGF receptor TKIs [63, 64]. Clinical trials investigating these combinations in breast cancer are currently underway, with interesting preliminary responses recently reported. Additional combinations include the combination of HER-2 kinase inhibitors with hsp90 antagonists, the latter inducing proteolysis of HER-2, and combination with inhibitors of the PI3K-Akt-mTOR (mammalian target of rapamycin) pathway, especially in tumors where there is evidence of pathway deregulation (for example, PI3KCA mutation). In light of its role in promoting tumor cell proliferation and survival in breast cancer, HER-2 is an attractive target. Trastuzumab validated HER-2 as a therapeutic target by changing the natural history of HER-2 overexpressing breast cancers by extending survival. One alternative approach to targeting HER-2 is via small molecule HER-2 kinase inhibitors, currently developed in the clinic. Lapatinib, the most advanced of these compounds, recently exhibited clinical efficacy when combined with capecitabine in a randomized phase III trial of patients with HER-2 over-expressing breast cancer. Lapatinib has also shown clinical activity as a monotherapy in women with heavily pretreated HER-2 overexpressing IBC. A number of other small molecule inhibitors with differing activity profiles are under development. Small molecule HER-2 kinase inhibitors have several potential advantages over trastuzumab, not the least of which is the possibility of reduced risk for cardiotoxicity and efficacy in settings of trastuzumab resistance. The use of oral small molecule HER-2 kinase inhibitors in combination with conventional cytotoxics and other targeted therapies based on scientific rationale represents the future for this important class of therapeutics. This article is part of a review series on HER2 therapy, edited by Mark Pegram. Neil Spector and Wenle Xia worked at GlaxoSmithKline within the past 5 years, and Iman El-Hariry is currently a GlaxoSmithKline employee.